So, what’s for supper, after going Japanese at Azuma? Some cheap and delicious street food, of course !!! 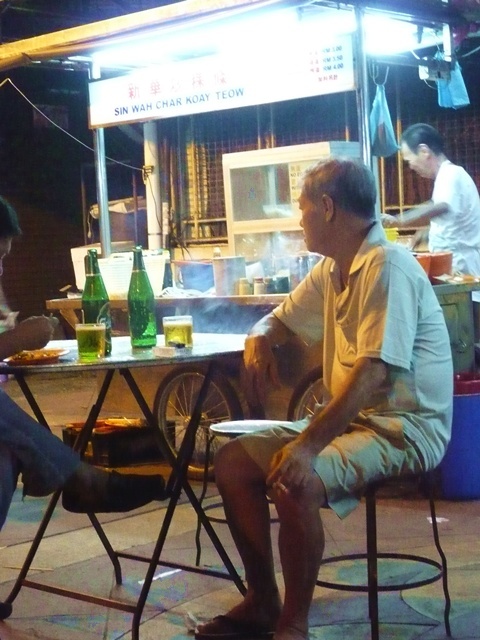 Penang is synonymous with great hawker fare. From the perennial favourite, Laksa, to Char Koay Teow, and Hokkien Mee (Prawn Mee to you and me) to Lor Bak, it’ll be a sin to die from hunger on the streets, and laments regarding “limited food options“. Admit it, people throng the island for the FOOD, more than anything else. 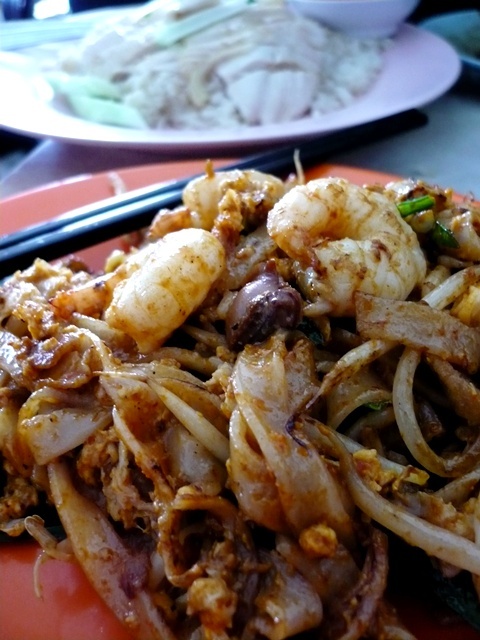 OK, so the image of Char Koay Teow in Penang may have been marred (or worshipped, depending on whether you’re on the receiving end of the malicious treatment!) by some of the most arrogant, and over-priced stalls selling the nearly ‘Gourmet’ edition of the simple hawker dish, up to the realms of about RM7 per plate. Sooner or later, a plate of CKT in Penang at RM10 would be the norms, with additional 10% service charge (that is, IF you’re not required to carry your own plate anymore) and 5% government tax (for the immense number of plates sold per day, they could be driving Royces/Porsches amidst the maddening Penang traffic!). Of course, the uncle manning the stall may have an attitude of his own. And his staff as well, for that matter. Ordering any number of plates of CKT will net you an intimidating glare, and grumbles about the estimated waiting time. Of course, I made the last one up lah …. He has yet to attain the Gold Medal in “The Laws of Arrogance” yet, amongst the CKT community in Penang. But a bronze may be hanging from his neck, for all I care. Nonsense aside (hehe, it’s Friday, so I’m a little off … understandable, right? 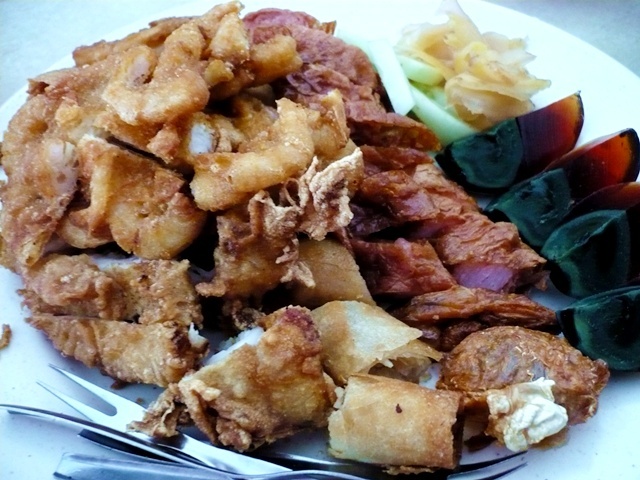 ), the CKT was bursting with ‘wok hei’ or ‘Breath of the Wok’ (sounds soooo much like a Kung Fu sequel wannabe), fried with high flames, and lots of crispy pork lards for extra cholesterol. And flavour, nonetheless. The prawns, squids, and cockles completed the package, earning top marks in my books. You can choose between chicken’s egg (RM3.50) or duck’s egg (RM4). Let’s say you do not wish to smother your already glossy lips with the oily plate of artery-clogger, no frets. Solution’s at hand in the form of Teo Chew Chai Koay, with fillings of either yambeans, or kuchai (Chinese chives). But they DO pan-fry them before serving, hence if you wanna avoid the grease, hold them off. Location : Pulau Tikus wet market, at night only. From town to Pulau Tikus using Jalan Burma, you’ll reach a police station on your RIGHT. Turn left into Jalan Moulmein, between two coffee shops (one’s named Kwai Lock, which I blogged before HERE on their Roti Babi), and you’ll reach a T-junction. The market’s to your right, but it’s a one way road, hence turn left and park anywhere you like. The next morning, initially planned for breakfast at Joo Leong in Bayan Lepas, popular for their toasts with runny half-boiled eggs. But the previous night’s booze session (hehe … fresh from Langkawi, no less) had us dozing off at 4am, waking up a little later than desired. The next best option? Brunch at Penang Road instead. 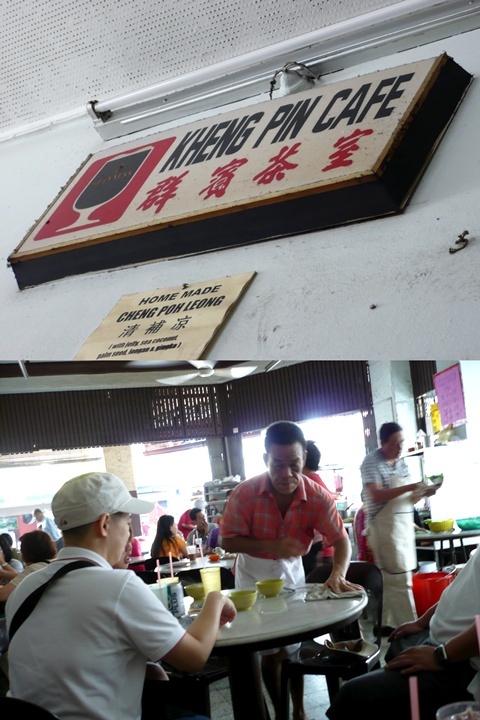 Kheng Pin Cafe on Penang Road possesses a certain charm, with history running way back into the olden days. Probably one of the few original coffee shops on Penang Road (Kek Seng’s a good candidate), the place is still buzzing with activities (eating lah … what else?!) on a weekday’s morning/afternoon. The Hainanese Chicken Rice has a lot of patrons, serving plump, tender chicken with fragrant rice. Not the best, yet the portion was more than sufficient, and better than most out there. 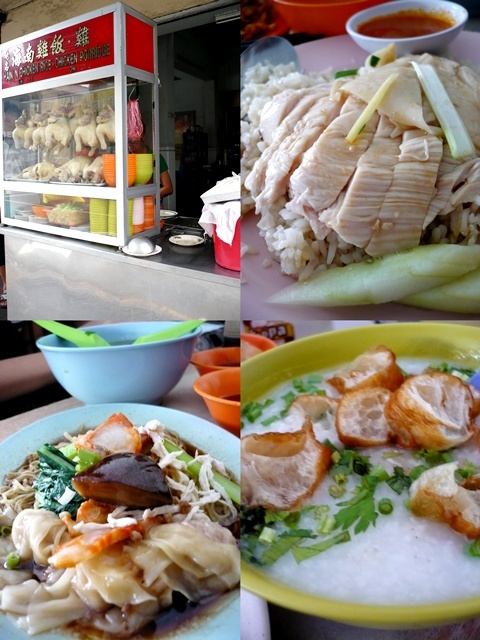 The Rasa Malaysia food guide listed two stalls in Kheng Pin, in their recommendation. One being the Char Koay Teow stall, frying up a commendable storm with the fiery CKT, complete with the usual package sans the squids ala Sin Wah’s. But the other recommendation came in the form of Lor Bak, or mixed fritters from all meats/vegetables/etc possible. The popularity of Kheng Pin’s Lor Bak transcends borders, races (except Malays, of course, it’s NON-halal), and appetites. Perfect as accompaniments to a meal, or light snacks during tea break, you’ll be spoilt for choice from the endless display of choices available. From the usual to the slightly out-of-the-ordinary such as fish, chicken, sweet potatoes and yam, the owner will be glad to recommend their signatures, or put your trust in him to mix and match the choices and the amount for the number of people specified. Location : Kheng Pin Cafe @ 80, Jalan Penang, Penang. Opens for breakfast til about 3pm only. By the way, I thought Teow Chew Chai Koay is pink color, no? Penang CKT is a bit lardy-the Lor Bak looks tempting. yeah… thumbs up for the Lor Bak..
Penang definitely have plenty of good food at reasonable price, I just hope it stays that way! Mouth watering shots! Good job! 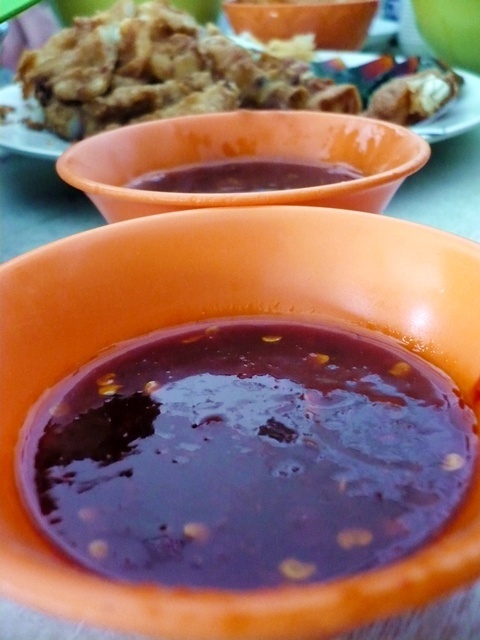 I heard my Penang friend told me that is a CKT in Penang selling at RM10 already….but he said very tasty…somewhere along Jln Dato Keramat. RM10 for CKT . . ..cant be right? kena con liao. . . . There are plenty of good food in this place and customers keep coming back even having difficulty finding a car park space. foodbin : yup, as lardy as they are, they’re downright sinful and delicious. Life for Beginners : a mere few for the time being lah, you must line up and get your own plate, paying premium price as well. Colin WOon : hi Colin, thanks and welcome. Simple Girl : RM10 already ah? wahlau … can buy 5 plates some years ago. FoodCrazee : I not so sure. but given the current spending power and inflation, who knows? ck lam : true, luckily we came an hour before lunch, hence parking;s a breeze on one of those side lane. kinda fruitful food hunting trip, huh?? Food Paradise : then do so! 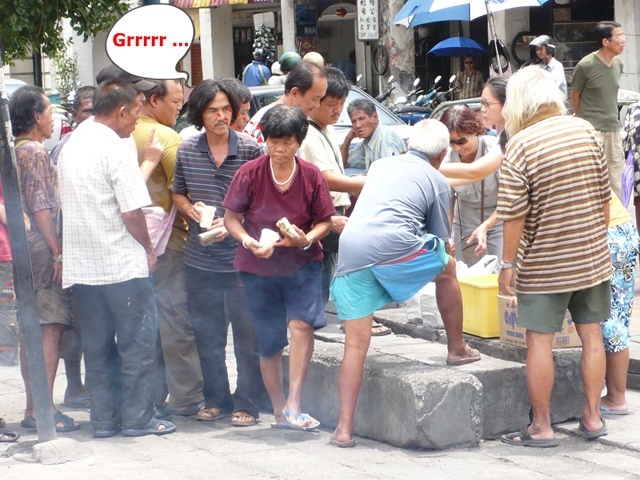 hehe … guess most have been to Kheng Pin for Lor Bak ya? yes, PT night market is really a gd hunt esp for those who want variety! was my every night dinner plc too last time..ehh that sinwah CKT last time used to pack in brwn papr and they giv u a set of chopsticks to ta pau right? now use plate? can i just ask one question.. where are the tikus in Pulau Tikus??!! MBoy : last time also about that price lah … I think. Chai Kuey nice lah. esp the Kuchai one. thenomadGourmand : the previous time we went also served on plates already woh. Cumi & Ciki : rather than rich in pests and roaches, Pulau Tikus seems to be flourishing with posh eateries, and good hawker food. ironic? 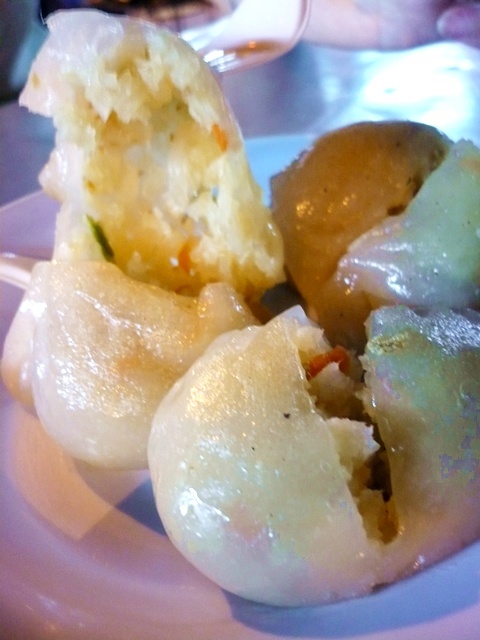 Have you looked at the latest Penang Street Food Guide by Star or something ? Try to compare their choices and if not happy with it you compile your own , publish it and we will buy 10 copies from you , then recommend 999 more other buyers and then give our alternate comments ! not sure if you still remember sugar bean. we haven been blogging for quite some time. miss ckt so much, the sight of it makes me miss malaysia so much as well. cheap and delicious food, cant wait to go home! allie : i didnt even do the picking. the uncle said OK, he’ll mix n match for us. Bangsar-Babe : oh really? Kwai lock’s version I missed one time cz they finished by lunch hour! Sugar Bean : sure I rmrb you guys. 🙂 yeah its been so long since hearing from you. You know the lor bak uncle is a bit ‘chuen’ I heard. Most of the time he’ll choose the lor bak for you, but if you attempt to choose it yourself, he’ll insist that he would do it for you! So it’s quite irritating cause we can’t choose! Lor Bak looks like it ROCKS … espesh the sauce, I love Lor Bak sauce ala Penang .. gooey with strands of egg white. iamthewitch : oh yes ah? no wonder he kept insisting on choosing for us. 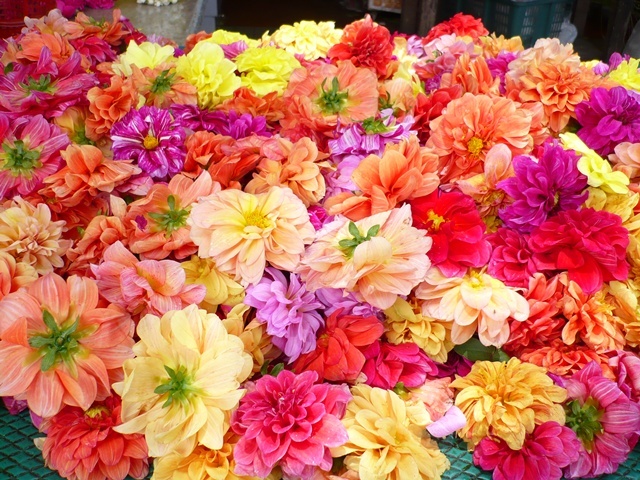 the better anyway, since most fritters look the same. FBB : CKT hou tempting eh? i need my fix also, but dunno where to look for in Ipoh. Woo..the CKT looked really good & saliva-inducing! 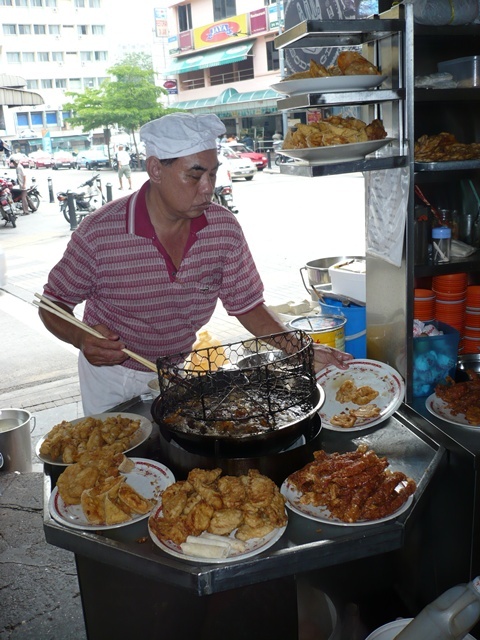 For sure, Penang is a food paradise, esp for hawker food! I bet you have to wait for quite some time for your chicken rice to arrive right? email2me : hahaha … not really woh. surprisingly she’s fast the other day. or maybe the crowd has not build up to a climax yet? 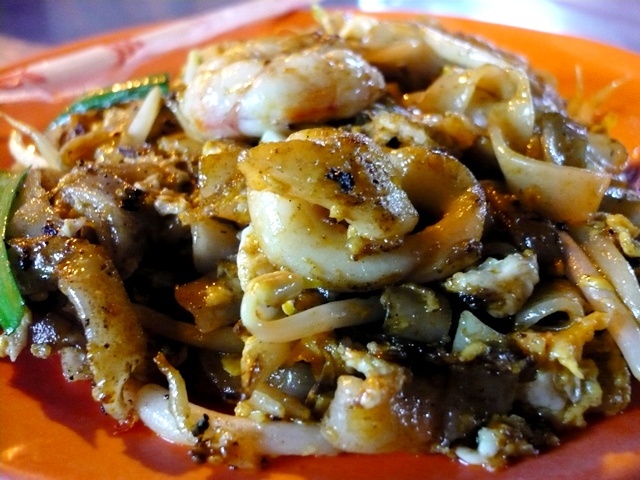 Aiyak…dun have the full address of the Char Kuay Teow? Just worry not able to find it. Hi there. Yeah, the address is at the end of the post, together with the map and contact number. Sorry I mistakenly thought this was the recent post. Sin Wah CKT is at the Pulau Tikus market. Behind this row of shops with Sin HWA Ckt opposite of pulau tikus police station. I had to pay $10.50 for my plate of CKT with extra fish cakes at the famous stall along Kimberley Road last week. And the portion was so tiny, I nearly gulped it down in one go! Your prediction of expensive gourmet CKT is truly and surely upon us!!! Yeah …. but RM10.50?!! That’s an all time high. Extra ‘kar liu’ and with premium seafood ah?